Algebraic meshes contain AlgebraicElements and AlgebraicNodes. They implement the node update functions that are used by the AlgebraicNodes to update their positions. Definition at line 635 of file algebraic_elements.h. Definition at line 643 of file algebraic_elements.h. Definition at line 649 of file algebraic_elements.h. Surely a proper destructor is required... ? Definition at line 661 of file algebraic_elements.h. Definition at line 867 of file algebraic_elements.h. Referenced by oomph::AlgebraicChannelWithLeafletMesh< ELEMENT >::AlgebraicChannelWithLeafletMesh(), oomph::AlgebraicCollapsibleChannelMesh< ELEMENT >::AlgebraicCollapsibleChannelMesh(), oomph::AlgebraicCylinderWithFlagMesh< ELEMENT >::AlgebraicCylinderWithFlagMesh(), oomph::AlgebraicFishMesh< ELEMENT >::AlgebraicFishMesh(), oomph::AlgebraicFSIDrivenCavityMesh< ELEMENT >::AlgebraicFSIDrivenCavityMesh(), AlgebraicMesh(), oomph::AlgebraicRefineableQuarterCircleSectorMesh< ELEMENT >::AlgebraicRefineableQuarterCircleSectorMesh(), and oomph::AlgebraicRefineableQuarterTubeMesh< ELEMENT >::AlgebraicRefineableQuarterTubeMesh(). Update the nodal position posn at time level t (t=0: present; t>0: previous). Must be implemented for every specific algebraic mesh. Implemented in oomph::DummyAlgebraicMesh, oomph::AlgebraicRefineableQuarterTubeMesh< ELEMENT >, oomph::AlgebraicRefineableQuarterCircleSectorMesh< ELEMENT >, oomph::AlgebraicCollapsibleChannelMesh< ELEMENT >, oomph::AlgebraicChannelWithLeafletMesh< ELEMENT >, oomph::AlgebraicFishMesh< ELEMENT >, oomph::AlgebraicCylinderWithFlagMesh< ELEMENT >, and oomph::AlgebraicFSIDrivenCavityMesh< ELEMENT >. Access function to the ith GeomObject. Definition at line 879 of file algebraic_elements.h. Referenced by oomph::Missing_masters_functions::construct_new_external_halo_master_node_helper(), oomph::Multi_domain_functions::construct_new_external_halo_master_node_helper(), oomph::Missing_masters_functions::get_required_master_nodal_information_helper(), oomph::Multi_domain_functions::get_required_master_nodal_information_helper(), oomph::Missing_masters_functions::get_required_nodal_information_helper(), oomph::Multi_domain_functions::get_required_nodal_information_helper(), oomph::RefineableTriangleMesh< ELEMENT >::get_required_nodal_information_helper(), and oomph::RefineableTriangleMesh< ELEMENT >::get_required_nodal_information_load_balance_helper(). Return number of geometric objects associated with AlgebraicMesh. Definition at line 873 of file algebraic_elements.h. Return a pointer to the n-th global AlgebraicNode. Definition at line 665 of file algebraic_elements.h. Update all nodal positions via algebraic node update functions [Doesn't make sense to use this mesh with SolidElements anyway, so we buffer the case if update_all_solid_nodes is set to true.]. Reimplemented in oomph::AlgebraicRefineableFishMesh< ELEMENT >, oomph::AlgebraicRefineableQuarterTubeMesh< ELEMENT >, oomph::AlgebraicRefineableQuarterCircleSectorMesh< ELEMENT >, and oomph::AlgebraicFishMesh< ELEMENT >. Definition at line 699 of file algebraic_elements.h. References oomph::Mesh::External_halo_node_pt, oomph::Mesh::external_halo_node_pt(), oomph::Node::hanging_pt(), i, oomph::Node::is_hanging(), oomph::HangInfo::master_weight(), oomph::Node::ndim(), oomph::Mesh::nexternal_halo_node(), oomph::HangInfo::nmaster(), oomph::Mesh::nnode(), node_pt(), oomph::AlgebraicNode::node_update(), oomph::Node::perform_auxiliary_node_update_fct(), oomph::Global_string_for_annotation::string(), and oomph::Node::x(). Referenced by oomph::AlgebraicFishMesh< ELEMENT >::node_update(), oomph::AlgebraicRefineableQuarterCircleSectorMesh< ELEMENT >::node_update(), and oomph::AlgebraicRefineableQuarterTubeMesh< ELEMENT >::node_update(). Self test: check consistentency of multiple node updates. Definition at line 834 of file algebraic_elements.h. References oomph::Mesh::nnode(), node_pt(), oomph::oomph_info, and oomph::Mesh::self_test(). Referenced by oomph::AlgebraicRefineableQuarterTubeMesh< ELEMENT >::self_test(), and oomph::AlgebraicRefineableQuarterCircleSectorMesh< ELEMENT >::self_test(). Update the node update info for given node, following mesh adaptation. Must be implemented for every specific algebraic mesh, though it may, of course, be left empty. 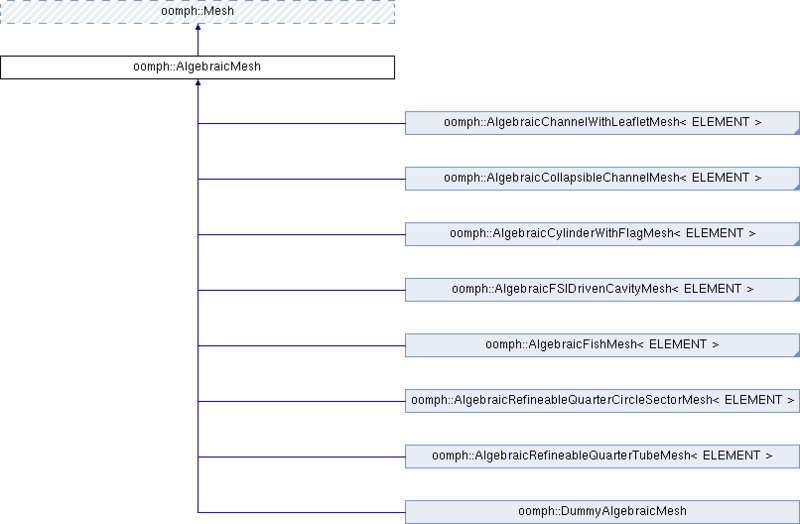 Implemented in oomph::DummyAlgebraicMesh, oomph::RefineableAlgebraicCollapsibleChannelMesh< ELEMENT >, oomph::AlgebraicRefineableQuarterTubeMesh< ELEMENT >, oomph::AlgebraicRefineableQuarterCircleSectorMesh< ELEMENT >, oomph::AlgebraicCollapsibleChannelMesh< ELEMENT >, oomph::RefineableAlgebraicChannelWithLeafletMesh< ELEMENT >, oomph::AlgebraicFishMesh< ELEMENT >, oomph::RefineableAlgebraicCylinderWithFlagMesh< ELEMENT >, oomph::AlgebraicChannelWithLeafletMesh< ELEMENT >, oomph::RefineableAlgebraicFSIDrivenCavityMesh< ELEMENT >, oomph::AlgebraicCylinderWithFlagMesh< ELEMENT >, and oomph::AlgebraicFSIDrivenCavityMesh< ELEMENT >. Referenced by oomph::Missing_masters_functions::construct_new_external_halo_master_node_helper(), oomph::Multi_domain_functions::construct_new_external_halo_master_node_helper(), oomph::Missing_masters_functions::construct_new_external_halo_node_helper(), oomph::Multi_domain_functions::construct_new_external_halo_node_helper(), oomph::RefineableTriangleMesh< ELEMENT >::construct_new_halo_node_helper(), oomph::RefineableTriangleMesh< ELEMENT >::construct_new_node_load_balance_helper(), and oomph::AlgebraicElementBase::setup_algebraic_node_update(). Definition at line 889 of file algebraic_elements.h. Referenced by add_geom_object_list_pt(), geom_object_list_pt(), and ngeom_object_list_pt().